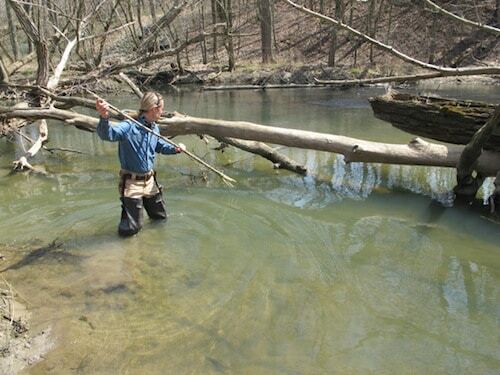 Creek Stewart is a Senior Instructor at the Willow Haven Outdoor School for Survival, Preparedness & Bushcraft and the author of the just released book, The Unofficial Hunger Games Wilderness Survival Guide. I didn’t invent these rules. Mother Nature did. This mantra has been around for many years. I’m a big fan of simple, easy to remember survival phrases like this. 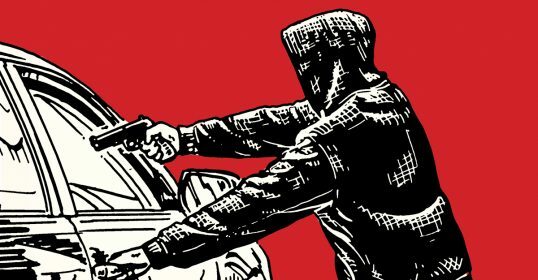 Sudden survival scenarios can feel overwhelming. The mind tends to go a bit crazy with panic and fear. Even simple tasks become complex. The emotions that come with being lost, stranded, or in danger can become paralyzing, overwhelming, and just flat-out scary. Easy to remember phrases like The 3 Survival Rules of 3 can help survivors regain balance and calm by helping to establish critical survival priorities. 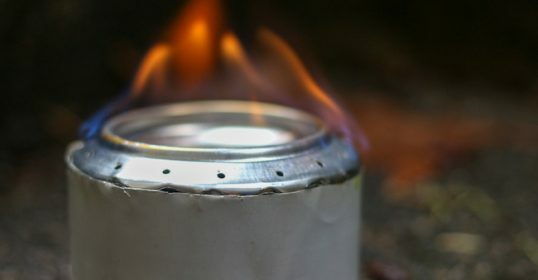 Often, it’s the simple things that matter the most in a survival scenario – like getting your priorities mixed up and pursuing food before shelter or water. With that said, if a survival ordeal lasts long enough, you will eventually need to put fuel (calories) on the human furnace. Gathering wild edibles is one of my favorite things to do. I absolutely love making a salad from fresh wild greens in the spring, foraging for berries in the summer, and digging starchy wild tubers in the fall. I’ve had many years of practice and consider myself a fairly adequate wild plant forager. I even teach a seminar for restaurateurs who want to incorporate wild foraged plants into their uniquely local menus. Even with all of this practice and skill, I can state with 100% certainty that I could not live long-term on wild gathered plants alone – especially in certain environments (desert) and seasons (winter). It is not possible for even the most experienced forager or survivalist. At some point, a long-term survivor will need the calories that only meat can provide. 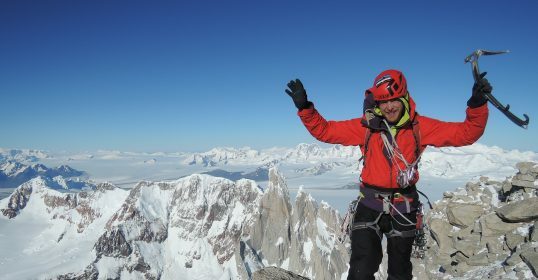 Survival hunting is a delicate balance of risk versus reward. One must always try to calculate whether the energy expense of making hunting tools and the act of hunting will result in an ultimate calorie loss or gain. Making hunting tools requires energy. Hunting requires energy. Field dressing and cooking requires energy. The goal is to choose a hunting process that trades the best chances of calorie reward for the least amount of calorie risk. I have a friend who sells items at fairs, festivals, and flea-markets. He always says to me, “Creek, the money is in the smalls.” He tells how it’s nice to sell a $50 or $100 item every now and then but if he depended on those products to make a living he’d be bankrupt. He tells me that he makes his living on the $1 and $2 items. This is the best analogy I can think of when it comes to survival hunting. You will make your living on the smalls. Don’t try to hunt the big ticket animals like elk, deer, boar, or bison. These animals require too much effort. You run the risk of caloric bankruptcy if you focus on these big ticket animals alone. Your chances of bagging one with primitive weapons is slim to none anyway, regardless of what you see on TV. Primitive peoples hunted animals like these in hunting parties of up to thirty adult men and it sometimes took many days. Even then they often came back empty handed. In a sudden and unexpected survival scenario with limited resources, your best hunting chances are with the smalls. These include wild game such as frogs, fish, rodents, snakes, birds, and maybe (if you are really lucky) rabbit, squirrel, groundhog, muskrat, and possum. 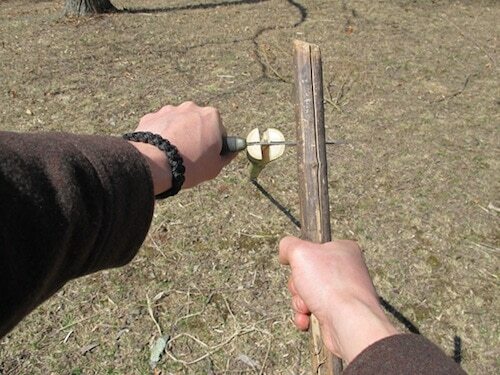 One of the best primitive-made multi-use small game hunting tools is what’s known as a split tip gig. Split tip gigs are still used in remote parts of the world to put food on the table every day. 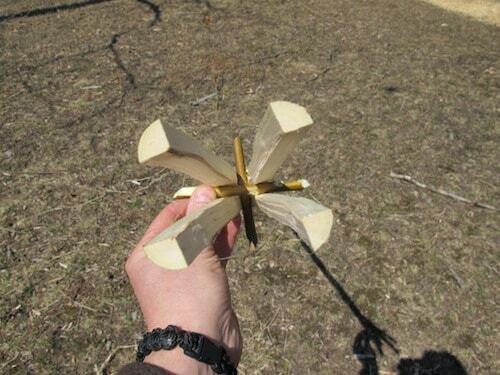 They are easy to make with limited tools and very effective at up-close and short-range distances. Below I walk you through how to make one. 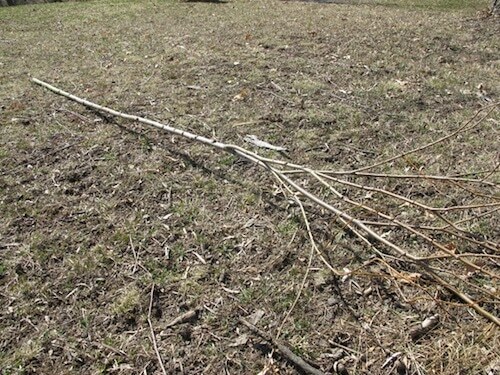 You want to start with a green sapling (small tree) that’s about 1-1.5 inches in diameter and 6-8 feet long. Dead, dry wood won’t work. You must cut down a fresh green sapling. 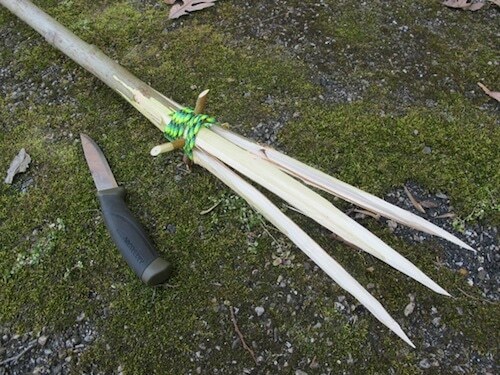 Bamboo makes an exceptional split tip gig, but most of us don’t have access to it. I like to use willow. 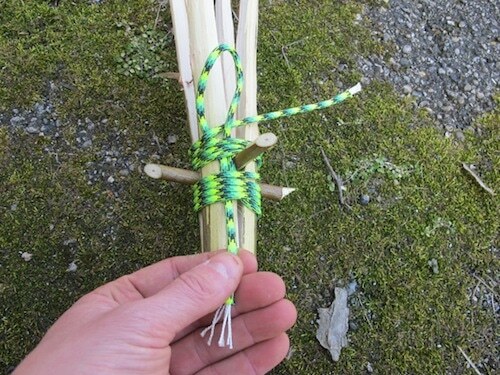 Willow is very common in places where you’ll get the most use out of a gig like this – near water. You can use virtually any species of tree as long as it’s nice and straight. 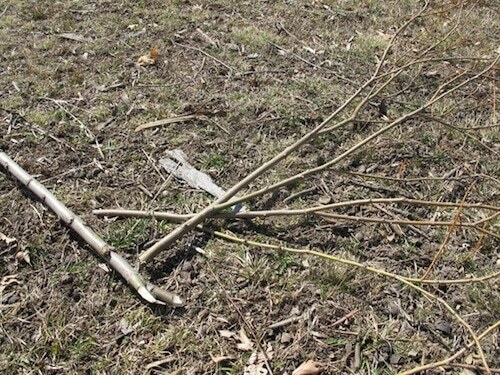 Next, you’ll want to trim away all of the branches and chop off the top where it starts to taper to smaller than 1 inch in diameter. The business end of the gig is made from the bottom of the sapling (the fatter end). 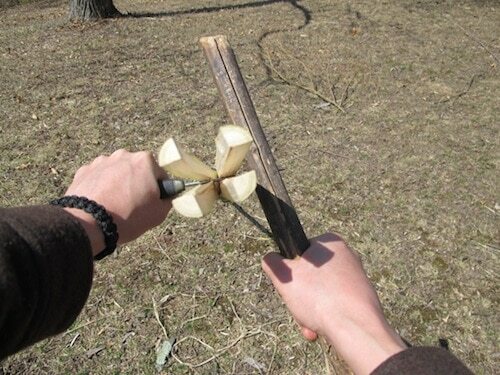 You’ll start by holding your knife or sharp rock directly across the bottom of the sapling. It must be as perfectly aligned in the center as you can get. 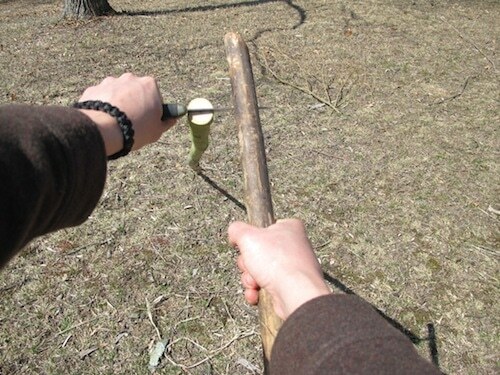 Drive your knife down the sapling about 10 inches or so using a stout stick or rock. I prefer a stick so as to not damage my knife. It’s important to split the gig shaft directly in half. This is known as batoning. Now, rotate the sapling 90 degrees and baton again. This will split the base of your gig into four equal quarters about 10 inches deep. 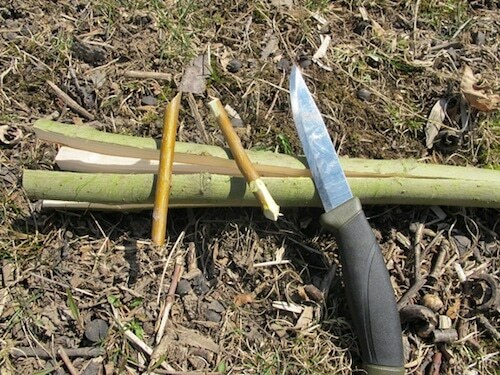 From the branches you trimmed off in the previous steps, cut two pieces of branch that are about the diameter of a pencil and two inches long. One at a time, push these down into the splits you just made. This spreads the tines of your split tip gig. You can now see the gig starting to take shape. Your gig tines should have about a 4-6 inch diameter spread. The benefit of a gig like this versus just one sharp tip is that it increases surface area; improving your chances of a successful strike. The tines also form wedges that help to trap and pin potential prey. Now it’s time to sharpen your tine tips to a sharp point. 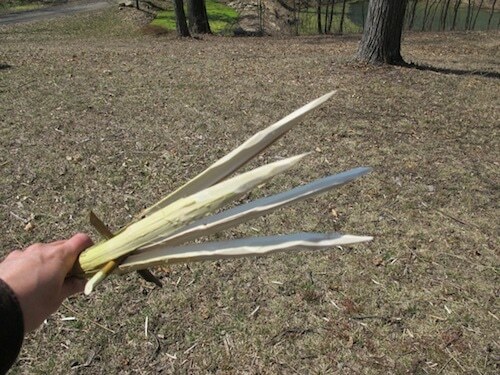 You will have to work your knife inside and out of the gig tines. 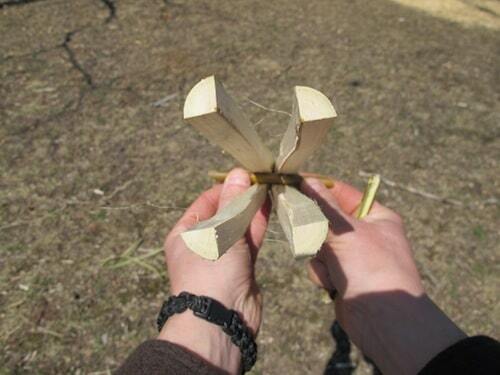 Willow is a very soft wood and is easy to carve. Other species such as walnut or maple are harder and will take more effort. 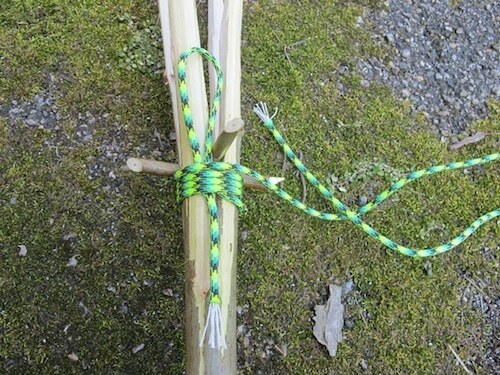 In spring and summer, the bark from willow (and many other species including mulberry and basswood) can be peeled and used as crude cordage to lash the end of your gig so that it doesn’t split out with continued use. If you only plan on using the gig a few times, lashings aren’t necessary. 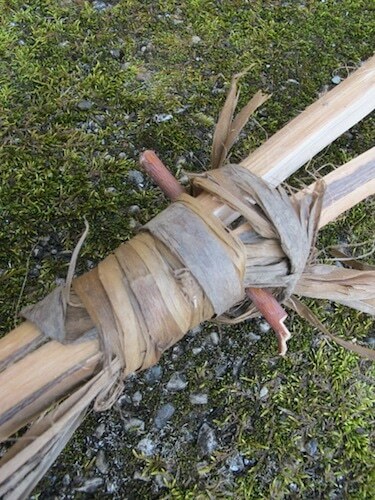 However, lashing the base of the splits makes the gig more durable and prevents it from splitting out. 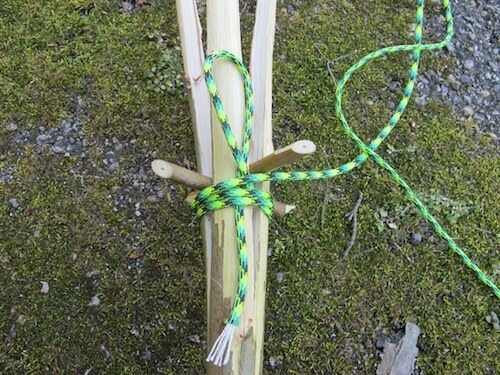 In the photo series below I detail a quick and effective lashing that works perfect with traditional cordage or primitive plant and bark fibers. 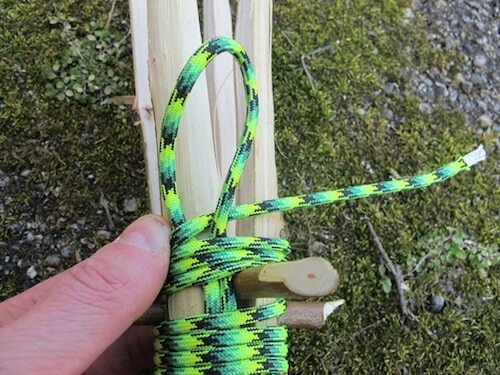 I’m using paracord so that it’s easy to see how the lashing works. 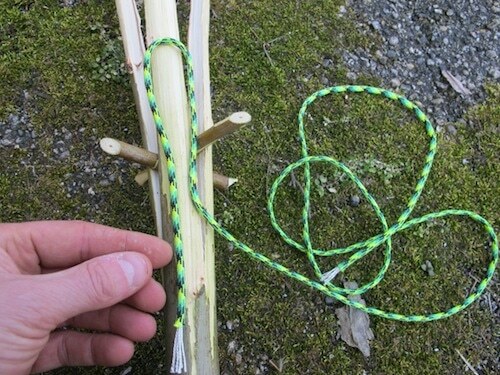 Loop one end of your cordage as shown. Wrap the long end around the gig and over the short end. Feed the end through the loop you made in the beginning. 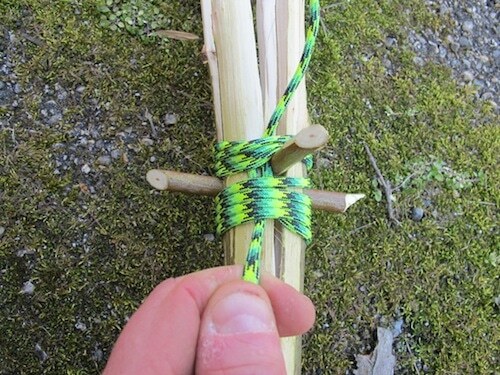 Firmly pull the bottom tail and the loop with the loose end of your cordage. Pull the loop just under the first couple of wraps and trim the two ends. Survivors are opportunists. Split tip gigs are perfect weapons of opportunity. Whether happening upon a quail hidden in a tuft of grass or spotting a frog on the bank of a muddy swamp, a gig is easy to use and quick to deploy. Gigging can also be a waiting man’s game. Oftentimes, waiting for a fish to pass within striking range or waiting for a rodent to peek its head out of a burrow can take a lot of patience. Either way, it’s a tool that works well as one goes about daily survival chores or while actively hunting and gathering. 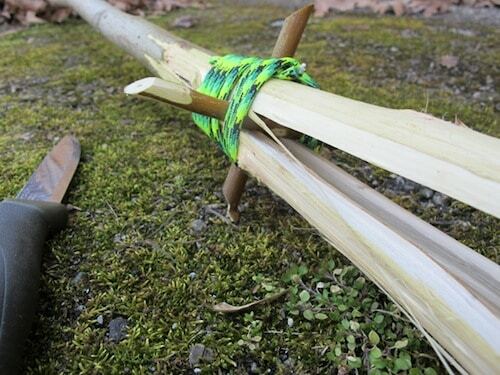 It can also be used as a self defense weapon, hiking staff, and cooking skewer. Gigs are most effective for game in and around water. Fish and frogs are primary targets. The American bullfrog is nocturnal and comes out at night during the spring and summer months. Shining a light into the eyes will prevent them from seeing you approach. Frog legs are nutritious, hearty, and an ideal survival food. Primitive tribes all over the world have used versions of the split tip gig for many thousands of years to put food on the table. From freshwater trout and salmon to sea urchins and coconut crabs, the split tip gig is one of the best marine hunting tools available. If you’ve never used a gig, I would suggest trying it at least once simply for the experience. Metal commercial gigs are available at many hunting/fishing stores for just a few bucks. They easily mount to the end of long pole with a couple screws. 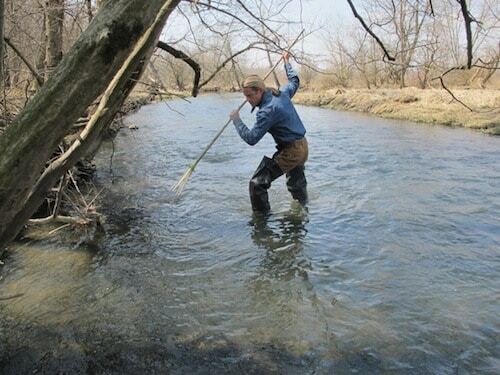 Check with your local DNR office about frog gigging rules/regulations/season for your state. 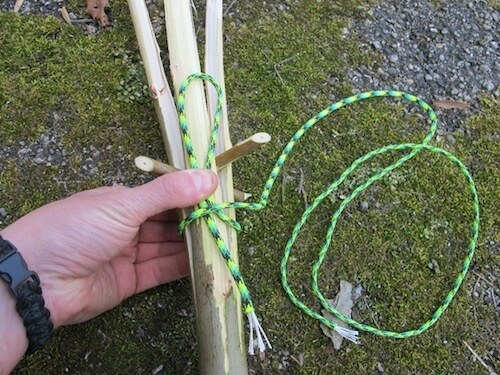 Most states don’t allow the use of a primitive gig, but using a commercial gig is good practice just in case you ever have to draw from your survival knowledge in a desperate situation. 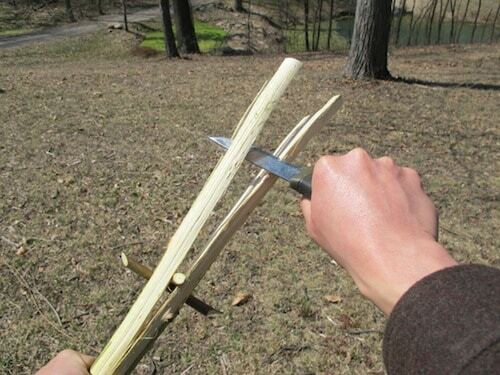 If you enjoy learning primitive survival skills like this one, consider picking up a copy of my new book, The Unofficial Hunger Games Wilderness Survival Guide. 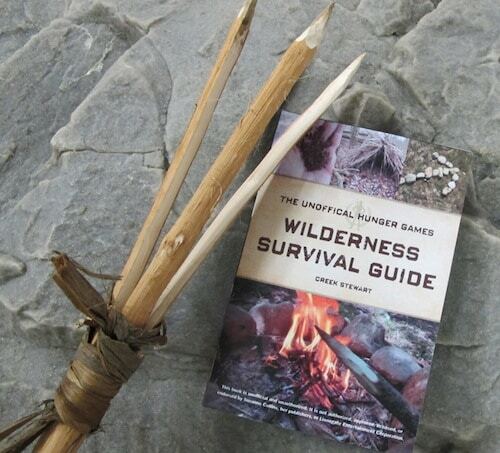 It is a primitive skills manual themed after the popular book series The Hunger Games. It’s a great read packed with practical lifesaving primitive survival skills in the areas of shelter, water, fire, food, and rescue. 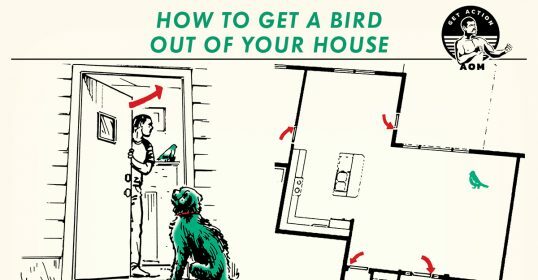 Great for getting kids interested in survival skills, but can be enjoyed by readers of all ages!